More articles on marketing here. If you want to start your web business using affiliate programs, click here. I was earning from my website an average of USD$100 one year ago and the income has increased to US$200 a month for the last six months. In the last two months, the income is hovering at US$400. The income is steadily increasing and I'm confident of the strategy that I've taken is on the right track. This business can help you get on the way to a passive income stream and it will take a while to see steady results. Here is how I can help you achieve the same success. I make two assumptions about you here. One: You are somewhat savvy technically in the sense that you know at least how to do simple things like "cut & paste" and "text replacements". It would be ideal if you know how to do a simple web page. Two: You will have the patience and persistence to promote and market your website using whatever free means and traditional means. 1. Once you have your website and domain name ready, you can "cut & paste" the html source code of the affiliate programs that you signed up with, from my website, and change the affiliate ID code to your own. In this way, you don't have to spend time to create your own webpage. Example, if you sign up with RichDad affiliate program, you can copy my webpage from http://sales-for-you.com/richdadtemplate.html and simply change the affiliate code "id=7115" to "id=999999" where 99999 is your own affiliate code. Click here for a detailed step-by-step description on how to do the code replacement. 2. As my webpage is already somewhat optimised for search engines, you can either submit to free directories or promote your website using traditional means. As I use the most popular submission software WebPositionGold Pro version, I can help you to submit your webpages for six months for free. Normally I charge a fee of US$10 every month when I do for someone else. I'm would be doing it for you free for six months if you write to me after your website is ready. 3. Your website would also be used as an example for me to showcase and I will link your website from my site. This way it also helps to bring traffic to your website. Like most other businesses, you won't make a profit on day one. Let's be honest to ourselves. Most business, including MLMs won't make you immediate money from day one. Most of the ads you see are part of their promotional efforts to market something that is attractive to those who are desperate or ignorant. The lowest cost approach to this business would cost you only $35 per year using the tight budget approach ( http://discovervalue.com/bizop3 ). As for what to promote, I would advise to start promoting the free stuff first as they would be the most popular - free ecards, free wallpaper, free cliparts, free email. There are others products you can move on to next, e.g. RichDad products, etc. 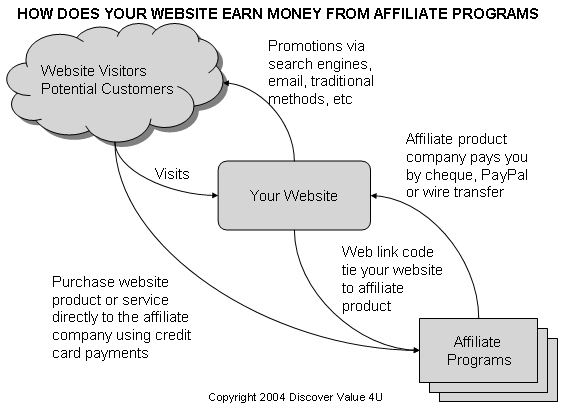 Do visit to my website at http://discovervalue.com/bizop1 and you'll see 3 possible approaches to doing an internet business using affiliate products and services. The three approaches differ only in the hosting package because each has its unique pros and cons. Approach 1 hosting allows you to earn a US$10 commission if another person signs up for the hosting package from your website. It's also feature-packed with the ability to many scripts including online forums, chatrooms, email, auto-responders, and much more. Approach 2 is good for those who are not technically savvy as the hosting package is extremely user-friendly and yet powerful in point-and-click features. The features offered in Approach 2 hosting is also quite powerful and many. Best of all, they are all point-and-click to install and deploy on your website. My own website http://discovervalue.com is created using this hosting package. Approach 3 is the lowest cost hosting package costing only US$35 per year. This package is suitable for webmasters as the only thing the hosting offer is storage space. Everything else need to be done by the webmaster who bought the package. If you are thinking of doing it yourself, do a self-assessment to decide which approach to take. If you have some budget to seriously do this internet business, I would recommend either Approach 1 (for web savvy people) or Approach 2 (non-web savvy people). To get started, you need a couple of things. - a credit card since the hosting subscription needs to be paid using a credit card. - Decide on a theme for your internet business. I would not advise you to do exactly as I have done on my website http://discovervalue.com as I have learnt that a website that is focused on its theme has higher ranking chances on the Internet. This is something I learnt from this journey, but it's too late for me to change that. Example, I've got a friend who started to follow my steps to set up a similar business. His focus is on Finance, and hence his website http://supermarks.com is currently promoting Richdad products and Stock Trading software. He has also put in an ecard page to help bring in more traffic. - You don't have to start from scratch. That's where I come in. If you are promoting the products that I've listed on my webpages, I've ready made pages which you can simply copy, change the affiliate code to your own, and put in your website. Finally, in my first year, I spent about 2 hours a day to slowly build up my website. Now I spent around 6 hours a week. My approach is quite simple, I take every opportunity whether online or offline to promote my site. So it's quite important to have your own biz card as part of your promotional tool. Feel free to email me if you have any questions. The Internet Toolkit is a complete guide to tapping into the unlimited potential of the internet. The topic by topic format allows you to learn and implement the strategies one by one so that you don't get overloaded with the wealth of information found in this guide, allowing you to achieve the success your after. Get yours today!